Fall is my favorite - and watching the wind blow the leaves and the sun peek through on a Sunday morning is my meditation and centering today. My show happens in just under 3 weeks. Three weeks today, I will be sitting with my coffee, decompressing post show! Thank you for all the support and emails and messages along this journey. It means the world to me. I have been asked during this process, "so what's the story behind this show?" What is this show, anyway? It's cabaret-esque. It's concert-esque. It's intimate. It's collaborative: The energy of a show like this evolves from the energy in the room, which involves the audience as much as the performers. The collaboration started with director, Trent Armand Kendall. He is a magnificent "vision-ist" (is that a word? well it is now!) who has the ability to stand back and see the big picture, and then go into the work without disturbing that big overview and make a subtle and clean adjustment, and allow something else to be seen vividly. He is a a riveting performer himself, as well as a writer and producer, radio show host and more. Ultimately, I trust him, and he respects and gets me. The work and the process can flourish in that environment. The collaboration continued with music director, Steven Ray Watkins. Steven simply sees honestly. He is able to listen, and then makes adjustments to discover what needs to be in highest relief within a song, within a musical moment, within an arrangement, and do it immediately, put it in his hands, and offer it through the keyboard and then through his arrangements for the band. He finds me in musical moments in ways that allows me to settle in, be safe and supported, and wraps me in magnificent musical energy. I have my cornerstones in my work and journey and process with these two men. For those of you who have followed the blog since the beginning, or caught up along the way, you know a little bit about my story. 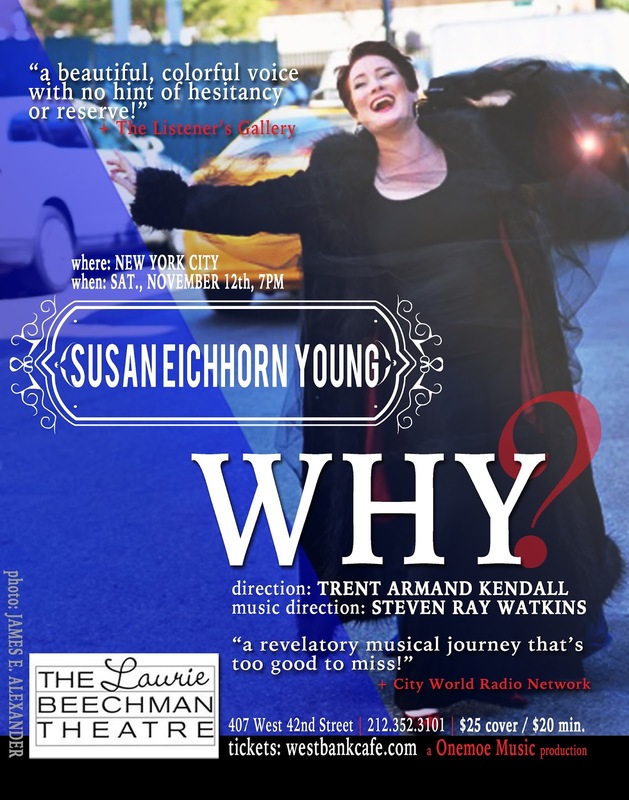 Without going into gory detail, or in the upcoming show, this is my return to the New York stage since before the 2011 near fatal car accident my husband, Thomas Young & I were in. I have been on stage more recently, but not in a concert/cabaret show that was mine to weave since that accident. Cabaret has always been my space. I love the intimacy of the space, I love the permission to break the 4th wall and take in the energy of the audience and be with them. I love the flexibility of using that 4th wall AS energy for the audience to simply have distance and observe, if need be. I am a believer in the story being told without value judgment. I believe in a story that has the ability for the listener to take away whatever they can see and feel and experience. I believe in making a journey visceral, and real. I believe in the universality of the human experience. My journey has just as many questions as yours. My experiences may not have anything to do with your experiences, but the ability to HAVE experiences brings us together. Questioning doesn't always reveal answers, simply more questions. Are we okay with that? Do we need more answers? Do we need answers at all? And as my daughter, Erin Elizabeth Eichhorn, reminds me, in her ancient wisdom: Sometimes we have to be okay to move on from the question that doesn't have an answer. The show celebrates life; Celebrates possibility; Celebrates discovery; Celebrates return, re-discovery, re-entry, re-creation, re-lease, re-lief: that you re-emerge into to a place you are creating NOW. The collaboration continues, with YOU the audience. We, together, weave the energy of the evening! We, together, lean forward, and lean back, and create the space between that allows the magic to stir.. 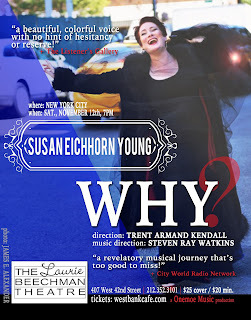 The show is called - Why? Join us, and celebrate LIFE! Saturday, November 12th 7 p.m.
beautiful and i cannot wait to be there! I'm back on stage in NYC!